Imagine that you were a person who has a lot to say. Imagine that you have strong opinions on just about everything and that you liked to talk…a lot. Now imagine that you open your mouth and the words just won’t come out. You know exactly what you want to say, but you can’t connect the thought with your vocal chords. You freeze, and instead, you sit in silence and let everyone else do the talking. Essentially, in a slightly less dramatic way, this is how I feel on a daily basis. I know I’ve addressed this probably a dozen times in my blog, but the language here is just not coming easy for me. I think I came in with this expectation that because I studied Spanish in school for about six or eight years, I’d know enough to pick it up at a fairly quick rate. I’m not sure how, but I was somehow given the impression that by the end of these five months here, I would be able to hold a solid conversation. Now, I’m not so convinced. As William Shakespeare said, “Expectation is the root of all heartache.” My expectations are certainly not being met in regard to me learning. After five weeks here, I feel no better about being able to express myself than I did on day one. Often times, I feel redundant and foolish. I know that it’s part of the process of learning, but at times, it can get to be mentally draining. In addition, castellano, or the Spanish language that is spoken in Spain, is dramatically different from the Latin American Spanish that is taught in school in the United States. Therefore, I have to focus so hard on what people are saying, or I usually won’t pick it up. Furthermore, I’ve made English-speaking friends so we usually speak in English because it’s easier. I need to figure out how to overcome this bump and plan the next step. I’m feeling a little down about it now, but hopefully it’ll get better. I can’t let myself complain too much, though. This trip is everything I’ve imagined and more. I’ve been doing a great deal of traveling and site-seeing, eating new foods and meeting new people. Travel is just as easy and cheap as everyone told me it would be when I got here. I have plans, and I’m going places, whoop! This past weekend, I went to Segovia with Crystal and some of my other friends from the States, and to say the least, it was a blast. We woke up bright and early to meet up at 8 and catch the bus from Principe Pio at 9:30. My ticket only cost 13 euros, round-trip, and the ride was only about an hour and fifteen minutes. We stopped off at a small cafe before we left called, “Café y Té,” where we had coffee and tortilla, which is a traditional Spanish dish made of egg. When we got there, the weather was ideal and in the 60’s the whole time, the sun shining and everyone walking the streets. 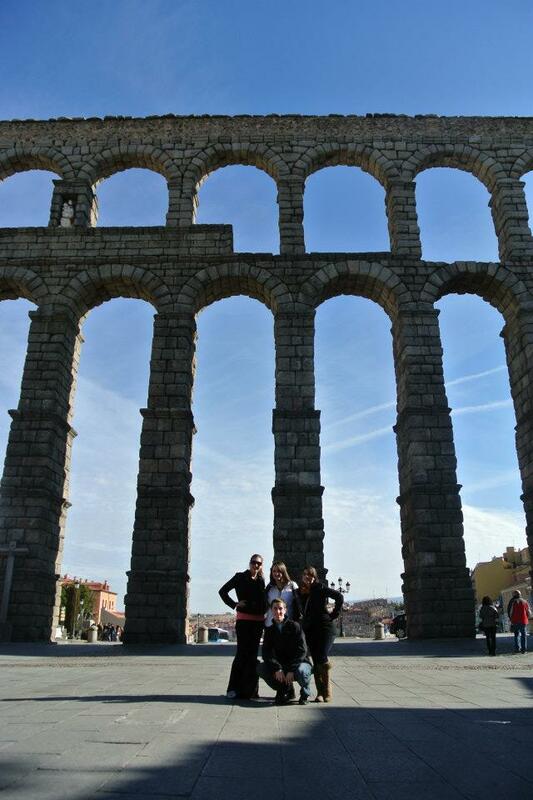 Our first stop was the Roman aqueduct that was constructed hundred and hundred of years ago. My host father told me that it was actually built into a mountain and then carved out, but the work was all manual. Can you imagine having to construct something without the use of any modern technology? Talk about challenging. This aqueduct is huge and stretched before me for miles. Slabs of stone are piled on top of each other in the form of arches, and there are two layers of these arches. Water is brought from the mountains and into the town using this aqueduct. Standing below it, a person is only a speck. After the aqueduct, we ventured to Segovia’s version of La Plaza Mayor, where there were a ton of restaurants, a gazebo, some architecturally-lavish buildings, and what I think was a basilica. We didn’t have a tour guide so I’m not one hundred percent positive on some of the details, but the design of the building was so detailed and incredible. In the corner of the plaza were two bakeries where we went and got a few sweets and snacks to munch on. Our friend Cora loves taking pictures, so every so often, we would stop for a photoshoot, or she would take an action shot of someone eating a pastry. After this, we headed for the castle, which served as a fort during times of turmoil here in Spain. There is a gate that you walk through that leads to a small park area in front of the castle, itself. A fountain ornaments the middle of the park, with various statues dancing on top of it for decoration. We crossed a drawbridge to get in the castle, and a quick glance to either side showed deep motes vacant of water. I love heights, but other people weren’t so fond of it. Inside the castle, we went up to the watchtower, but to do that we had to climb 150 stairs. It doesn’t sound terrible at first but when you’re doing that many stairs straight up a spiraling tower, you start to question your initial notion. I’d like to think I’m in shape, but after that march, I realized that I probably need to start working out a bit more. By the time we got to the top, we were all out-of-breath. The rooftop area was wide open and from any given point, you could see all of Segovia. Merece la pena, as they say in Spanish (It’s worth the pain). To top off the view, a Spanish flag blew in the wind on top of one of the walls, a tribute to us being in Spain. After the tower, we explored other parts of the castle, including some of the old armor suites that knights used to wear. The castle also boasts some of the most luminous and beautiful stained-glass windows. At the end of our tour, however, we stopped off at the basement for a photoshoot in the cellar. I posed as a prisoner 🙂 From there, we stopped at a restaurant where I had the most delicious chicken, bacon, carrot, and lettuce sandwich ever. I was in heaven. Those were pretty much the highlights of the trip, and from there we grabbed another coffee and headed back to Madrid where we hung out at our friend’s apartment, walked around a bit, and then got crepes and milkshakes. I think the whole trip was made better by the fact that it was so last-minute. We were talking with our friend on Thursday about how we didn’t have plans for the weekend, and he looked some information up and that was that. I love that I can travel so easily. This weekend, we’re going to Granada and are going to spend the night in a hotel for the first time since we got here. I’m so excited! As for everyday life here, it’s pretty much fallen into a routine. I wake up, go to class, eat with Conchi, try to motivate myself to run, do some homework and go on Facebook. 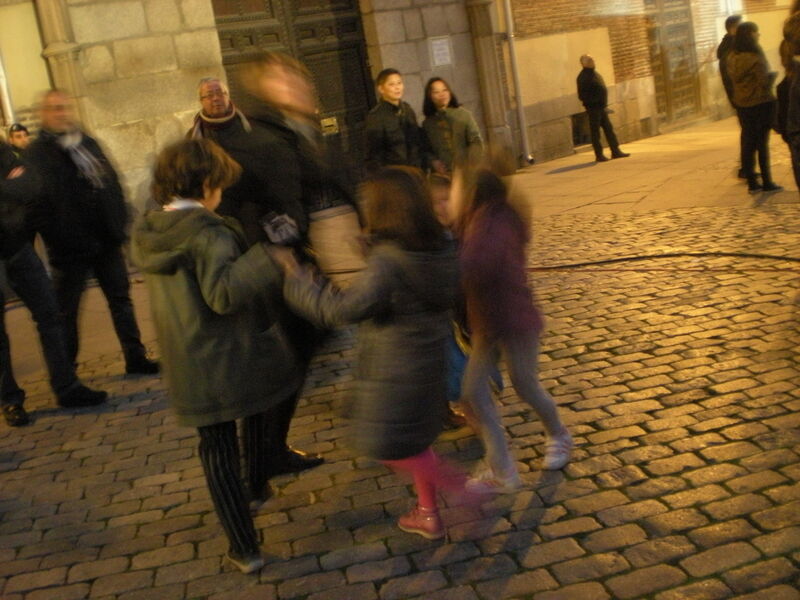 At night, I usually go into Villviciosa for tapas with friends or go putter around and explore Madrid. I always have to make sure that I’m home for mealtimes, though, because Conchi always cooks something for us. Mealtimes are different here, though. Lunch is usually around 3 and dinner is usually around 10, so I’m starting to get used to eating very late and eating a ton of food at mealtimes. I would usually feel bad about eating so much, but everything my host family eats is healthy, so I feel less guilty. Tomorrow, we’re having a huge dinner with my host family and their son and soon-to-be daughter-in-law because it’s Conchi’s birthday! She’s sincerely the sweetest person ever and while the communication aspect isn’t always easy, she’s a very relaxed and charismatic woman. She talks a lot about Crystal and I coming back to visit her in the future. There’s no doubt in my mind that I will definitely be back here to visit. This Sunday marks the end of my first month here, and what a month it has been. Since the last time I wrote, I’ve seen so many things that have opened my eyes a little bit more to the world I live in. Of course, there have been a few spotty moments of frustration and a few pangs of homesickness, but a lot of new experiences. Classes began for me two weeks ago and it was a catastrophe. The classrooms changed at the last minute, professors failed to show up for class, and I was certainly in for a rude awakening with the language. I found myself sitting in a Spanish photography class, struggling to pick out words that I recognized from my professor’s long-winded speech about the supplies we would need and the projects we would be working on. I could get the gist of it, but details like what kind of paper we needed simply eluded me. Terrified about my future in that class, I went to the international office to switch out; I wasn’t taking the class for credit, anyway. After waiting in a line for about an hour to talk to someone, the lady very rudely rushed me to pick another class. When they didn’t have the options I wanted, she simply told me she was going to give me the English version of the photography class. I didn’t argue because I didn’t feel like intensifying my headache. It wasn’t until later that I realized that with the class change, I was taking three classes in English and only one in Spanish. This truly frustrated me. My thought was, How am I suppose to learn if I keep leaning on English as a crutch? What most people don’t realize is how easy it is to go to a foreign country and get by without ever speaking the native language. True, my host family doesn’t speak English, but almost all of my friends and professors do. To practice your Spanish, you truly have to go out of your way to make the effort. Knowing this, I knew I had to switch to another class to practice. So, I went back to the office later in the day, only to be chewed out my the same lady for, “Making her job harder by changing my mind.” This is a lady who is paid to help ease my transition to life at UEM (Universidad Europea de Madrid), not condemn me for making sure my schedule works for my needs. I calmly talked to her, and in the end, she apologized for being rude, but numerous other people here have claimed to have the same issues with her. Once I switched, I was taking two classes in Spanish and two classes in English, which I think is the perfect balance. However, I later had to deal with the issues that came with ensuring that these classes would count for credit, which was yet another struggle. Thankfully, I worked it out. It still seems like many of these classes haven’t truly gotten started yet, so hopefully my third week will flow a bit more smoothly. To take my mind off the stress of the first week, I started running again, which was greatly overdue. I’m out-of-shape to put it frankly, but running has given me a chance to take in the community. 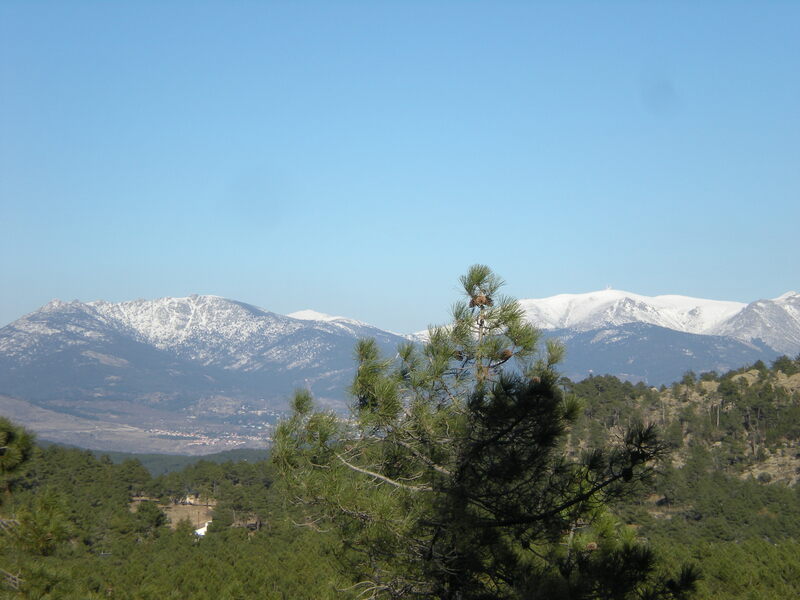 The more I see of it, the more I realize how opposite El Bosque to my hometown. Houses here are very clustered together and every house is gated with an intercom next to each entrance. The streets are very clean and big gray-and-yellow bins are placed strategically throughout the streets for people to dump their garbage in. La Calle Leizarán is shaped like a horseshoe and from the very middle of the street, there is a clear view of miles and miles of mountains and trees. 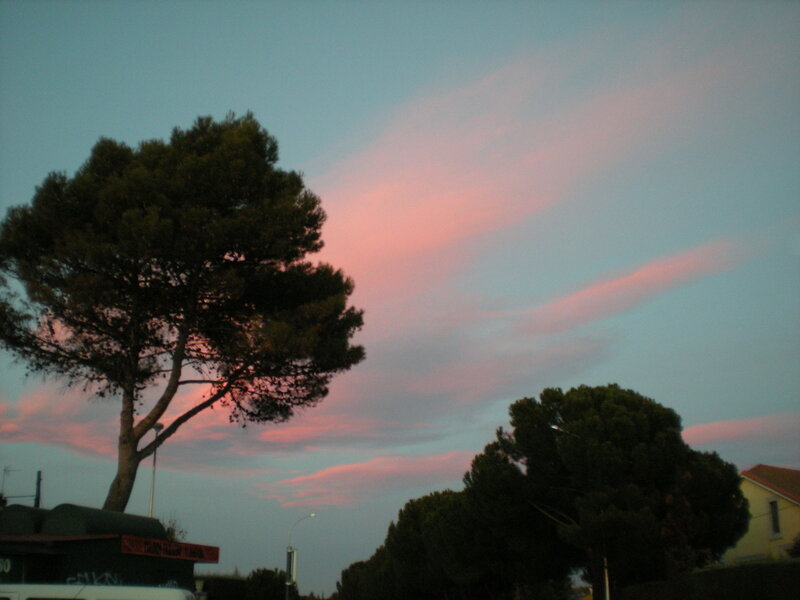 Residential areas of Madrid are very clustered, but they are separated by huge areas of wilderness. Just off the median of our street is an extensive dirt trail meant to be used as a bike path. It is completely isolated from the rest of the world and is perfect to just relax and take a breather. Apart from that, however, there is one area that I run that I have deemed “Dog Alley.” The second I entered that part of the street, at least twenty dogs start wailing at me from behind the fences: good for the owners, but incredibly distracting. Almost everyone in my community, except for my own host family, owns a dog or three. In addition, there are stray cats everywhere! Not a day goes by where I don’t see a dozen or more cats roaming the streets without any owners. I usually have to fight the urge to pick one up and take it home with me. I’m not sure Conchi would appreciate it if I did. Beyond running, however, I’ve been exploring different parts of Madrid. Last weekend, we went to one of the most incredible memorials ever, El Valle de Los Caidos (The Valley of the Fallen). Essentially, it is a huge cross on top of a mountain, and while it sounds simple and unimpressive, it’s probably one of the most inspirational places that I have ever been. 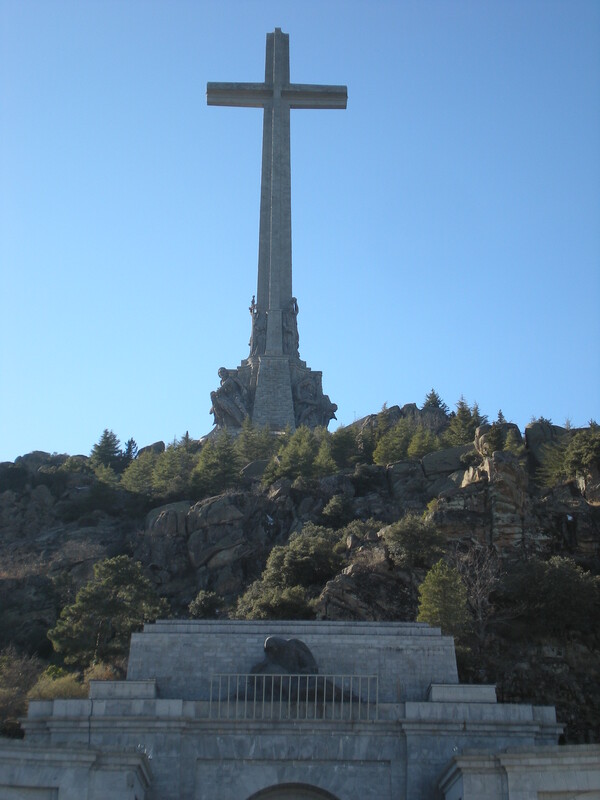 It was constructed by former dictator Francisco Franco to honor those lives lost in the Spanish Civil War. Franco is actually buried inside the basilica that is directly below the monument, as are some of the victims of the war. In front of the entrance to the basilica is a huge plateau that stretches out before you, lined by a wall at the far end. Beyond that wall is unadulterated wilderness for as far as the eyes can see. Mountains roll in the distance, capped by snow and below there is nothing but trees. I cannot stress the enormity of the cross or the incredible detail devoted to the figures of angels around its basin. I cannot stress how small it made me feel in comparison to the vastness of the world. I cannot stress how much I could sense the bloodshed that took place in that area years before. 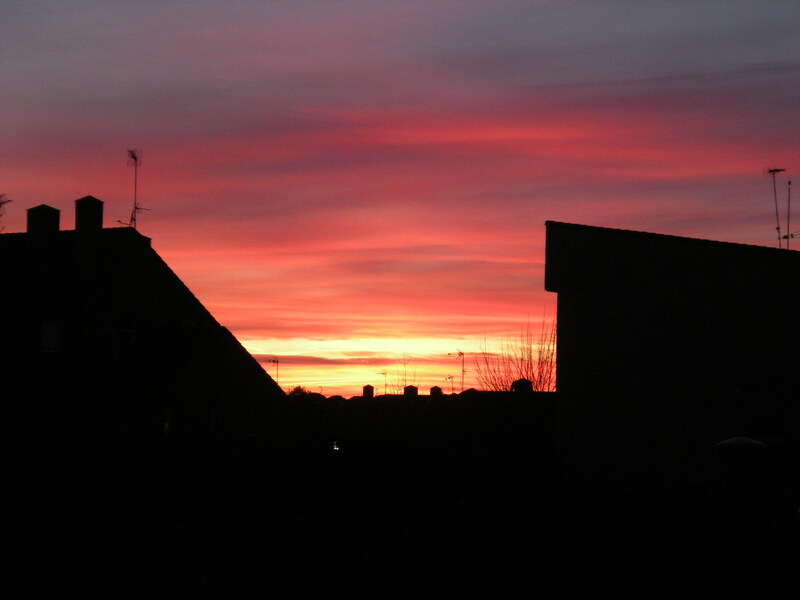 Looking out at the scenery made me feel at peace in this world. I felt closer to heaven than I have ever been before. The entrance to the basilica resembles a plaza and three archways mark each side of it, with one more in the middle that leads inside. Above the middle one is a statue of an angel cradling a fallen soldier in her arms; symbolism at it’s finest. Inside, you have to pass through a security checkpoint, much like those in airports. Cameras and cellphone use are prohibited. Past that is a grand entrance gate made of metal with angels fashioned from gold at the top and saints lining the panels. The main room is lined with eight tapestries on the walls, each with the heavens fighting against evil on them, though there are different scenes on each one. In front of each is a description of the scene, in both Spanish and English. I read the Spanish for practice. Between the tapestries are six sanctuaries devoted to different saints, and above each one is a statue of an angel doing different things. All of them are stronger and more fierce than what you would picture an angel to look like; the one was crushing a serpent beneath her feet. As I walked through the building, I was constantly forced to look up, and I couldn’t help but be struck at brilliance of that design. By having everything so big and high, it forced me to look toward the heavens, something that I should be doing in everyday life. After the room with the tapestries was a large chapel, with three sections of pews surrounding the altar. In the center of the altar was a log cross with a graphic representation of Jesus nailed to it. It was far more disturbing than any of the other crucifixion statues I’ve seen. On the floor of either side of the altar were tiles with names on them, flowers surrounding each. These are the burial sites of both Francisco and José Antonio Primo de Rivera, a fascist leader in Spain. Directly over the altar is a huge dome, painted with a scene of angels and God on it, and angels surround all sid es of the altar. Behind the pews are two more sanctuaries on either side, with smaller alters to pray. I lit a candle for my grandpa and my best friend’s dad, in honor of their lives, then knelt down to pray. I was overwhelmed by the spirit of the place and for a few hours after we left, I said very little, not out of sadness, but by pure inner peace and ease; pardon me if I’ve verging on being overtly corny or cliché. 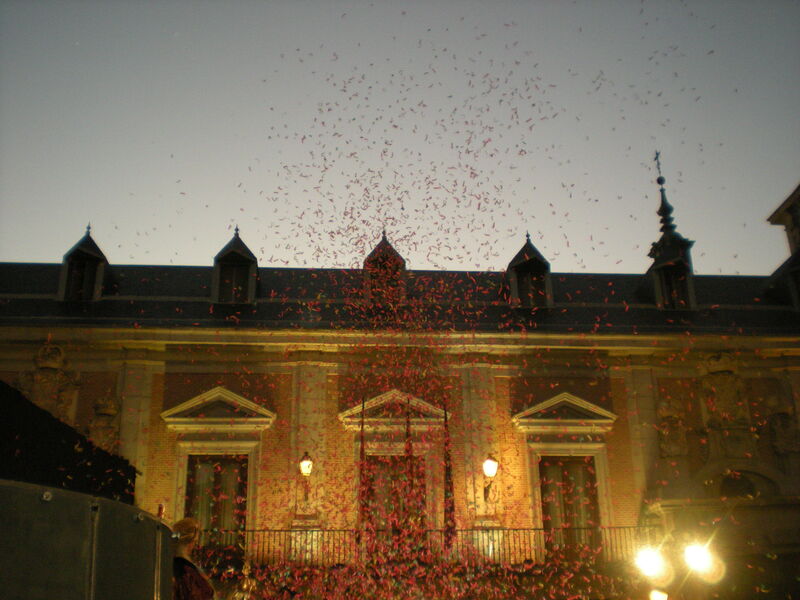 As for this weekend, it is Carnaval in Spain! 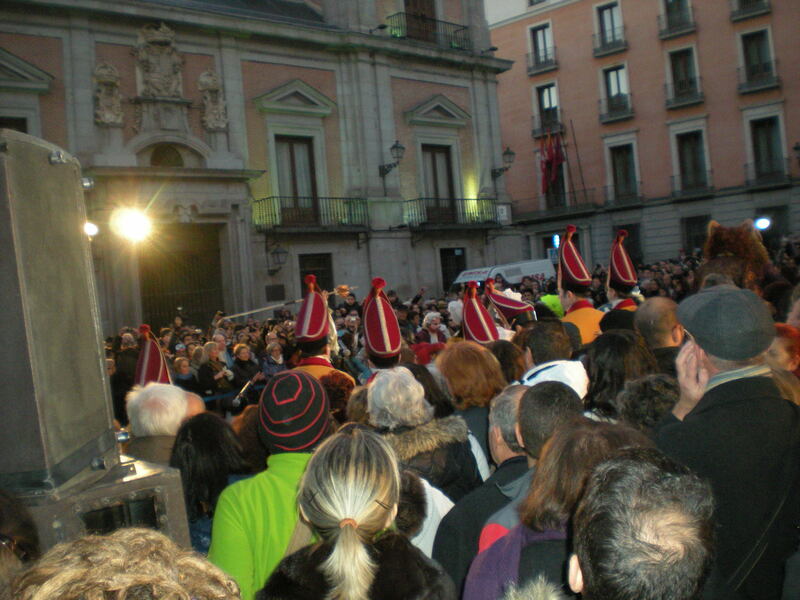 Carnaval is a very old cultural festival that has its roots in Catholicism. Supposedly, it started as a pagan festival to the god of vine and spirit, Baco and grew into a nationwide celebration of art and identity. 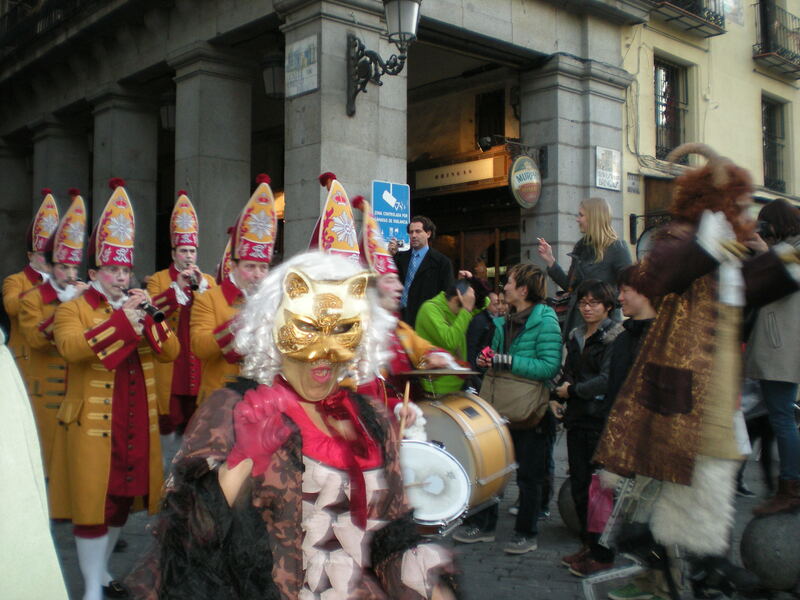 For three days out of the year, people dress up in costumes and parade through the city. There are dances, music, and food. People literally come from all over the world. 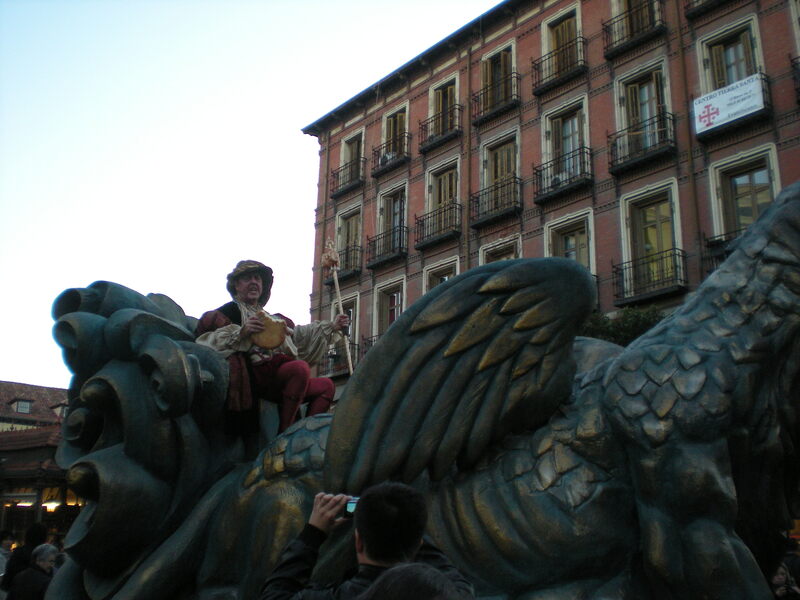 Today was the inauguration, or opening of the festival and to kick it off, people dressed in various costumes, some as horses, others as medieval princesses, and pranced through the streets behind a giant raft with a man sitting on top of it. Crowds of people followed to this one center, where a famous Spanish celebrity talked for a while about the start of Carnaval. From there, there was a concert and the streets were packed to their limit, different languages mushing together. The spirit was intense, and nothing compares to it in the States. Tomorrow there are more things going on, so Crystal and I are going to head in to the city and explore more. ¡Viva la Vida! Yesterday was probably the busiest day I’ve had yet in Madrid. We woke up at 7 to get to the university by 8:30, where three powder-blue space-like buses were waiting for us. We signed in with the lady who organized the event and headed out to Toledo. Four students were assigned to be tour guides if we wanted to be showed around, and we went with three of them around the city. In Toledo, the streets are incredibly narrow, but people still manage to navigate and drive without crashing, which was quite a feat. The architecture everywhere in Spain is old and unique, and the roofs of the houses in Toledo are mostly brown and textured. The rest of the house is made of stone, though some are painted earth tone colors. Most of Toledo is a hill, and the buildings aren’t very tall, for the most part. 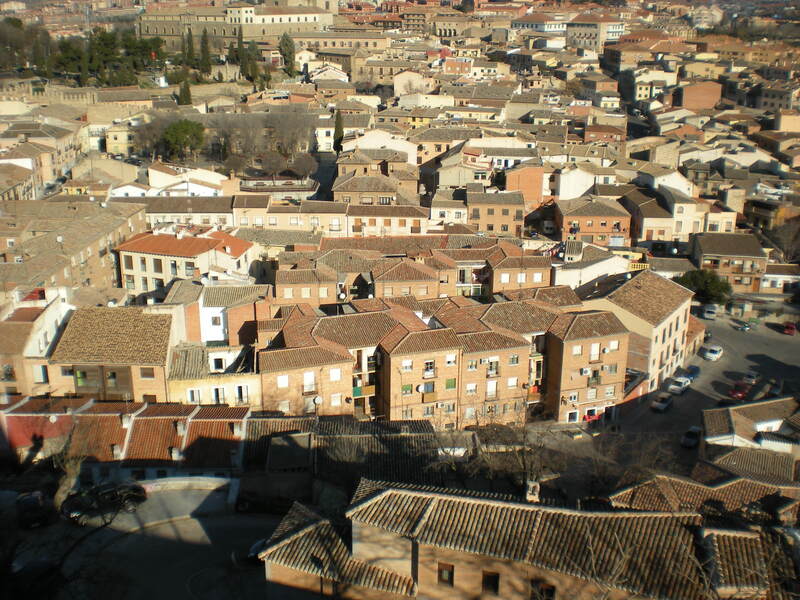 From certain places in Toledo, you can see the tops of houses for miles, and to say the least, the view is stunning. For lunch, our group of people ate at a Chinese-owned little dive, where we all pushed tables and chairs together. I felt bad for our waitress, who was struggling to take care of us and the other customers in the place, but she did a decent job. I had a zumo de naranja, cafe con leche, y un sandwich vegetal con huevos. It was delcious! Later, we broke off into smaller groups, and Crystal, Taylor, a couple other girls, and I went shopping for a while. I bought myself a fan with a picture of Toledo on it, and a small gift for someone else. Apparently it is customary in touristy places to wrap souvenirs, which I thought was incredibly nice. 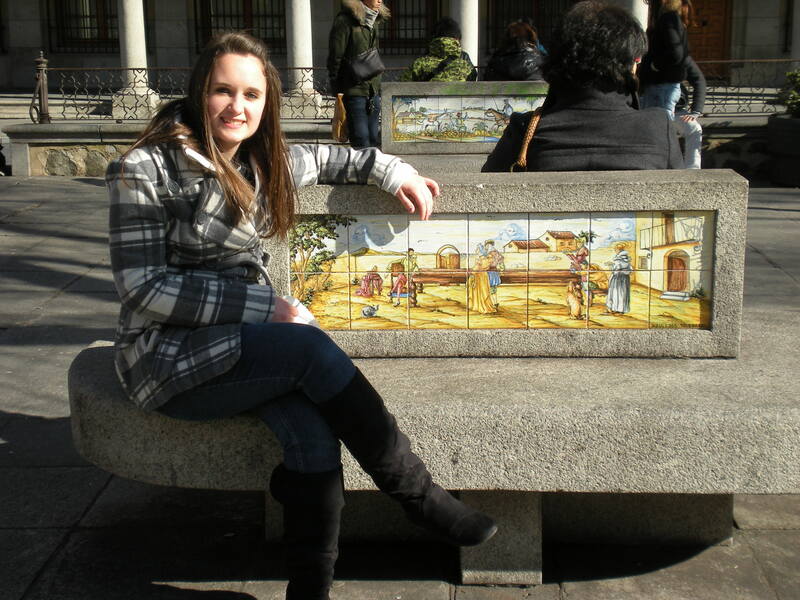 When we finished looking in the shops, we walked around some more and found a center area where the benches had paintings of different scenery on it. We took a picture with a statue of Don Quijote and walked through a small museum that we stumbled upon. By that time, we had to head back to the bus, but a couple of the girls invited us to hang out with them later. I ended up falling asleep on the bus because I was so exhausted, but overall, it was a great trip and a great chance to get to meet some new people. I’ve only been here for two weeks, but already I have so many things that I’m committing to memory because they differ so much from American customs. For instance, I know I’ll remember eating diced strawberries coated in sugars out of small bowls and huge spoons with Marta and Conchi. In the States, we are so accustomed to a fast-paced kind of lifestyle that we seldom slow down to do things the right way like dicing up our strawberries. When I told my host mother, for example, that I usually don’t eat breakfast at home because I rarely have time, she was taken back with surprise. Here, my host family sits down together for dinner every night around ten (they eat so much later here! ), which allows us for time to talk and bond a little more. Furthermore, like clockwork, my family eats three meals a day, usually followed by a piece of fruit and yogurt. They eat constantly, but almost everyone in this city is so thin, partly a result of everyone walking everywhere. On the weekends, my family likes to stay in their pajamas most of the morning and lounge around and relax. Then later at night, they get dressed to go out for drinks with their friends, and while I’m usually quite the busybody, I’ll have to admit that it’s nice to relax. However, at night, a lot of people are insanely active, and their nights often don’t start until 1:00 a.m. We went to the city last night after dinner with Carmela and Indie and some of the metro stations were busier than I ever saw them during the day. A big group of us went out on the town and experienced a discoteca, where people got together and danced their hearts out. Everyone was very relaxed and fun to be around, and apart from one episode, I enjoyed the company. Tonight, I may go with some new friends from Boston to watch a soccer game, then hopefully tomorrow we’re going to go to the center of Madrid. I spent most of my day writing in my journal and my blog, and I’m proud of myself for writing almost everyday in some shape or form. I just hope I have the time once classes begin on Monday. One thing is for certain, however, the customized wooden pen that reads “Follow your dreams” from my parents, has been put through extensive use already! These pictures say more than I ever could.